Hey everyone!!!! I just got back from and exhausting but completely awesome day in LA. Why were you in LA Jaime you ask? I went for the 2011 Romantic Times Expo and Teen Day. This is a week long convention where authors do signings, giveaways, and talk on panels. I couldn't go the whole week but, when I learned that there was going to be a Teen day plus the book signing expo on Saturday I couldn't pass that up! So I booked my flight to fly down that Saturday morning big mistake. I now know to fly down the night before. I arrived in LA at 10:40 am and the book signing started at 11, the super shuttle we were on didn't drop us off at the hotel until 11:30, needless to say we were running around like chickens with our heads cut off trying to check into our room and the Expo. Once settled in the craziness ensued. The Expo was intense! I have never been to a signing like that it was awesome people had suitcases full of books to have signed and some of the lines were very long. Why were these line long you ask? Well the answer is this amazing YA/Teen authors Richelle Mead, Cassie Clare, Holly Black, Alyson Noel, Melissa Marr, Ally Carter, Kimberly Derting, Sarah Rees Brennan, Alexandra Monir, Kami Garcia, Margaret Stohl, Jeri Smith-Ready, Tera Lynn Childs, Sophie Jordan, Rachel Vincent, Kelley Armstrong, Melissa de la Cruz, Carrie Ryan, C.C. Hunter, Kristi Cook, and more amazing authors were there. That was just the Teen Alley!!! There were about 15 or 16 other rows with romance authors of all types including Paranormal Romance and Urban Fantasy. 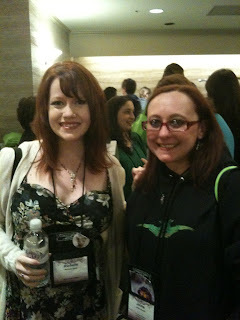 One of my favorite PNR authors Adrian Phoenix was there as well I even got to have an early dinner with her and discuss all things Dante and Von. After the Expo and the nice dinner with Adrian we had a speed dating thing where the authors moved from table to table to discuss their books and basically whatever else they wanted or we wanted, then off to the Teen Party. Let me just say that was my favorite part of the whole thing! Not only did we get bags full of swag and books including some ARC's but, we actually got to hang with the authors. I sat with Melissa Marr for a few minutes and she actually asked me how I thought the day was going (she was the captain and ran the whole thing) I was amazed she wanted my opinion. I also spent time with my two good friends, authors Jeri Smith-Ready and Kristi Cook. I even rode the elevator with Cassie Clare. It was an amazing day!!!! I'm so tired today but it was all well worth it. There are more pics than the ones up above so I'll post a link to my flickr stream below. If you all get a chance I suggest going to a signing the authors are great. Oh my goodness, I'm so freaking jealous!! I have been to one of those expo type signings but nothing that crazy. So glad you had a great time! RT was a blast! So sorry I missed you Lisa! Next time you're in Sacramento we should get coffee or lunch. I can't believe I missed Sophie Littlefield who was hidden in the adult section. I would have loved to get Banished! I think I might go to Chicago for this next year if the YA authors will be there - and also bring a better camera. It sounds like an unforgettable time - except for your flight. I definitely want to go to Chicago! They've already scheduled Melissa Marr, Charlaine Harris, and JR Ward! Yeah you should've stored your books in our room sorry I didn't think of it. The teen party was amazing. OOOHHH - Charlaine Harris. I have got to go. No question! No worries about the room - so nice of you to offer belatedly. I should have also picked you guys up at the airport, but didn't think about it until I got in my car that a.m. I'm so glad I got to meet you too, albeit briefly with all the chaos. And it was so cool you had lunch with Adrian Phoenix! Thanks Pam :) that means a lot coming from you! I used to love going to book events like the expo when I worked for Waldenbooks in the 90's! I once went on a cruise/cocktail party and took a pic with the newest "Fabio" for a new romance line. Can't remember his name or the Series and when I look at the pic, I know it's because I might have had "too good" a time. Who knew I that I was an expert at partying "Kafe Castro" style so early on??? These events are so great and so much fun! Love the pics! Thanks Christina :) haha yeah they are crazy fun! I'm still tired today. Thanks Nancy! I really wish you could have been there with us. Looks like fun! I'm jealous!